Join us for a very exciting kick off to the Adirondack Lakes Cuisine Trail! Free tastings and info about the opportunities for locals and guests to the area. A Grand Opening Tasting Event featuring locally-sourced foods offered by a variety of regional venues. The gathering is an EAT ADK preview event open to the public. There is no charge to attend. Festivities will take place at the new Moody Farm Venue, an exceptional location with amazing High Peaks views. Several regional businesses will offer tastings and samples of the Cuisine Trail’s typical fare. The menu runs the gamut, from maple candied walnuts and maple granola bars to local smoked sausage stuffing bites made with homemade sourdough. Tables confirmed to date include The Wild Center, Moody Farm, The Ganzi at Paul Smith's College, the Hotel Saranac, the Trading Post @ Fish Creek Ponds, Adirondack Perk, the PSC VIC, Adirondack Cavu Café, and the Lake Clear Lodge & Retreat. The evening will include remarks and an update on the Adirondack Cuisine Trail Network, a collaboration among six trails to elevate the North Country’s profile as a cuisine and tourism destination. A presentation by Paul Smith’s College faculty and students, who have conducted a strategic study for the cuisine trail organizers, will be featured. Representatives from ROOST will unveil a new data-driven website, adirondackwayfinding.com, designed to help travelers discover itinerary-based travel opportunities in the Adirondacks. 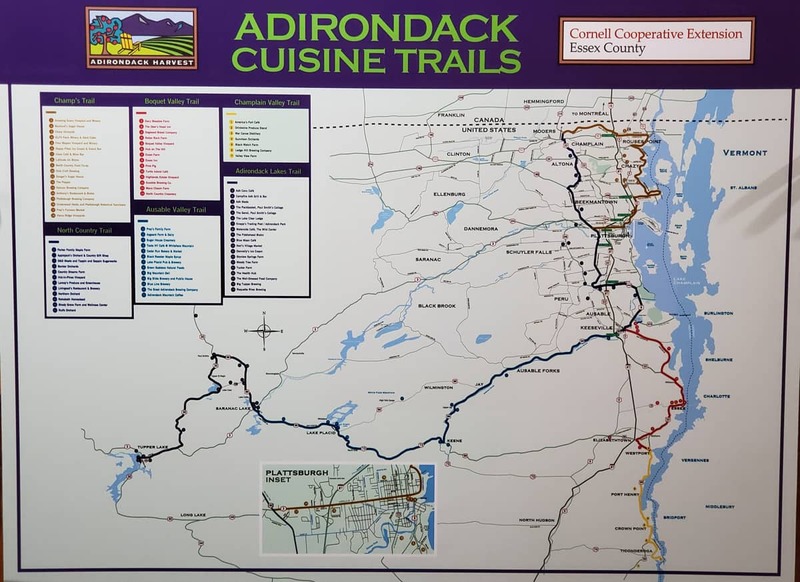 The Adirondack Lakes Cuisine Trail features nearly 20 venues located on a scenic route that takes travelers through Tupper Lake, Lake Clear, Paul Smiths, and Saranac Lake. Trail description: history, food and nature come alive as the ancient Adirondack waterways forged the paths of the Native Americans, pioneers and lumbermen. Its healing woods created the flavor of the Cure Cottage days with unsurpassed recreation, culture and arts as the era of Grand Hotels, historic inns and lodges blossomed. Savor this experience through historic farms, great camp dining, downtown eateries & breweries. An historic travel corridor where you can flavor your senses within the vibrant downtowns of Saranac Lake and Tupper Lake to the farm and food experiences of the St. Regis Canoe area - NYS only wilderness canoe region. All participating venues are committed to including locally-sourced agricultural products among their offerings for consumers. The trail program is administered by the NYS Department of Agriculture and Markets in collaboration with NYS Department of Transportation. NYS Cuisine Trails are a part of the Taste of NY marketing campaign; a full list of participants can be found at the Taste of NY site. We hope to see you there - please RSVP on Facebook if you can!